What a cracking day to sit on the couch and do nothing except watch footie. World Cup favourites Brazil lost to the Netherlands… and I’ve desperately tried to write in a Dutch oven joke. No luck, feel free to write in your answer below. This game was the Felipe Melo show. First he set up Robinho’s goal to send the Samba Kings flying. But in the second half, he collided with his own goalkeeper and headed in a Wesley Sneijder cross. The goal tied the game and rattled Brazil. Then, Melo’s frustration with uber-pest Arjen Robben boils over. He kicks Robben to the ground and then inexplicably stomps on the Dutchman’s thigh. Red card and it was “Boa noite” for the Brazilians. Melo’s red card was 11th ever for Brazil, putting them one ahead of Argentina for most in WC history. I think’s it’s off the mark to call this result an upset. Netherlands have not lost a competitive match since the Russians beat them in extra time in a Euro 2008 quarterfinal. That’s a streak of 13 matches. And they are on a run of 24 games without a defeat, since a friendly loss to Australia two years ago. Meanwhile, Africa’s dream of a home-grown World Cup winner died after Ghana lost to Uruguay with a bizarre finish. Just before the end of extra-time, Uruguay’s goalkeeper was caught out of position during a goal-mouth scramble. Luis Suarez kicks the ball away, only for Dominic Adiyiah to head the ball back towards the net… where Suarez raises his arms to deflect the shot. Red card for Suarez and a penalty for Ghana. But then Asamoah Gyan sends the jabulani sailing into the crossbar… and sends the Ghanians home in tears, after Uruguay win a penalty shoot-out. Now the Uruguayans have to manage the high-flying Dutchmen (ho ho!) without the rambunctious Suarez, who is definitely suspended for the semi-final. They’ll also have to do without Paris Hilton, who was arrested for allegedly passing the Dutchie on the left-hand side. Late game: Spain plays Paraguay. After a somewhat subdued opening round, the first two games of the knockout stages did not disappoint. With sheets of rain sweeping across Nelson Mandela Bay Stadium in Port Elizabeth, Uruguay and South Korea both played with a sense of urgency… which was a treat for both partisans and neutrals alike. Luis Suarez was magnificent, scoring both of Uruguay’s tallies. The first one came when Diego Forlan raced to catch a loose ball at the touchline, turning and sending a cross through the box. The Korean keeper missed it and Suarez was waiting. 1-0 Uruguay. A miscommunication between Fernando Muslera and captain Diego Lugano resulted in a collision, and a gift for Bolton’s Lee Chung-Yong. 1-1. By the way, there were four Diegos on the pitch during this game. Weird. The winner came on what might be the goal of the tournament. The ball was headed away from the pack in front of the net, after a Forlan corner. Suarez gets the ball, swings past his man at the edge and sends in a bendy ball that hits the post, deflecting into the net. Awesome, as was his celebration. Uruguay’s win marks the first time since 1970 that a South American team other than Brazil or Argentina has advanced to the quarterfinals. Boateng celebrates after opening the scoring. Ghana-U.S.A. was a repeat of a group match in 2006… and it produced the same result. Kevin-Prince Boateng put the Black Stars on the board after only five minutes — Ghana’s first goal from open play in this tournament. The U.S. coughed up the ball at the centre spot, and Boateng left-footed it past two defenders and the keeper. The U.S. got back on the board on a penalty, after Clint Dempsey was brought down in the box. The game remained tied after 90 minutes, and so began the tournament’s first taste of extra-time. Three minutes in, Asamoah Gyan scored his third of this World Cup — and it proved to be the winner. 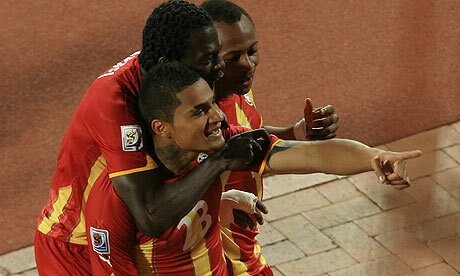 Ghana becomes only the third African team to reach the quarters, after Cameroon in 1990 and Senegal in 2002. Landon Donovan says his team was naive, by not putting Ghana away. For the second time in a row, the Black Stars knock out the Stars and Stripes. Uruguay and Ghana play next Friday.